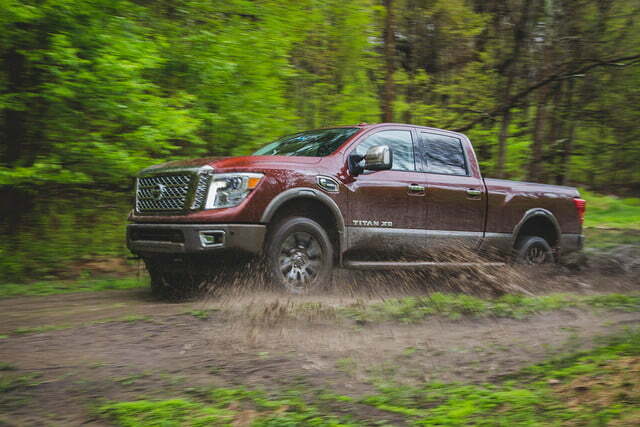 Burly but plush, Nissan's Titan XD is almost too pretty to get muddy. Almost. 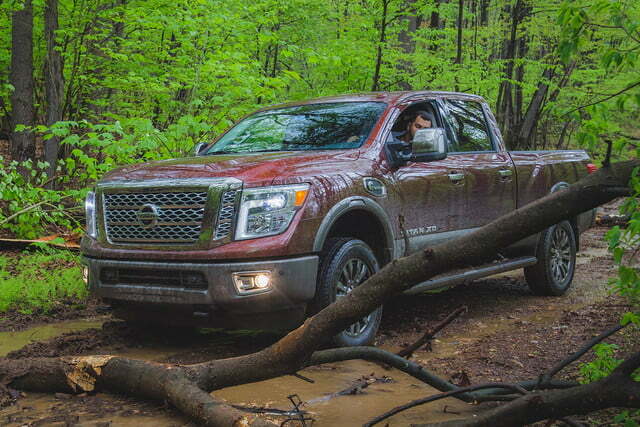 Nissan's diesel-powered Titan XD offers brute strength without the brutal ride. 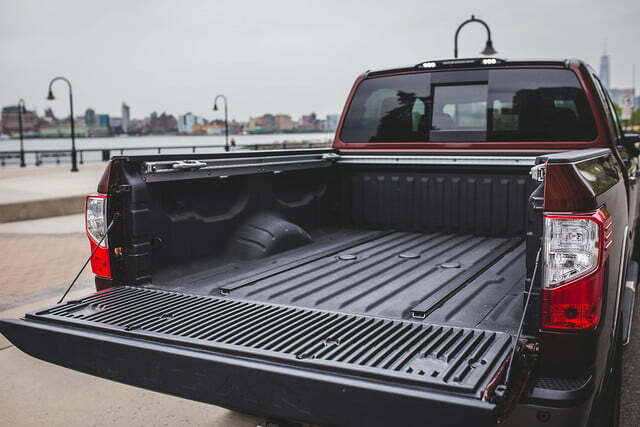 The full-size pickup truck gene pool consists of more than just the stalwarts from America, thanks to imports like the Toyota Tundra and the Nissan Titan. Both are proven and worthy alternatives to the popular Ford, Dodge, or GM truck. But after turning the crusty old age of 12 last year, the Titan was in need of an update. 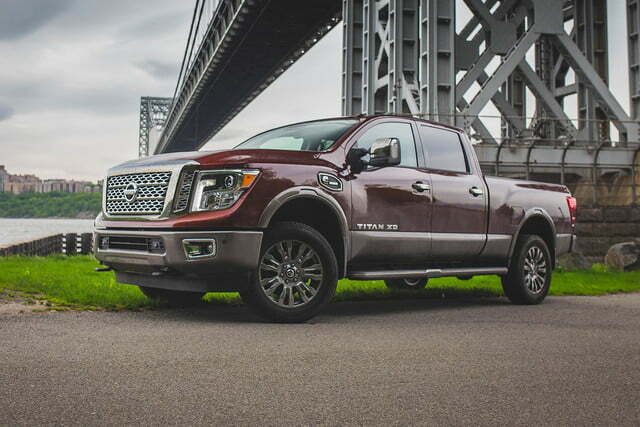 To make it fresh again, Nissan introduced a totally new generation of Titan for 2016. 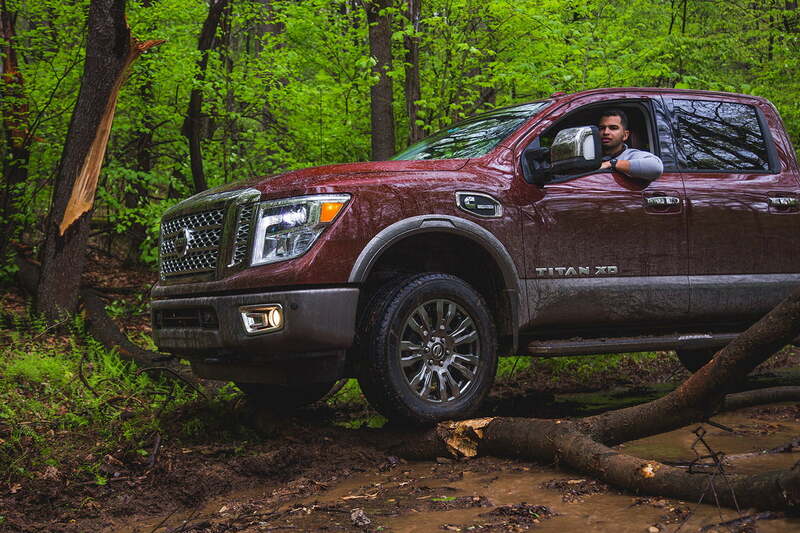 With a powerful yet fuel-efficient new diesel under the hood, and an array of plush amenities, the optioned-out Titan XD Platinum Reserve offers to do it all without compromise. 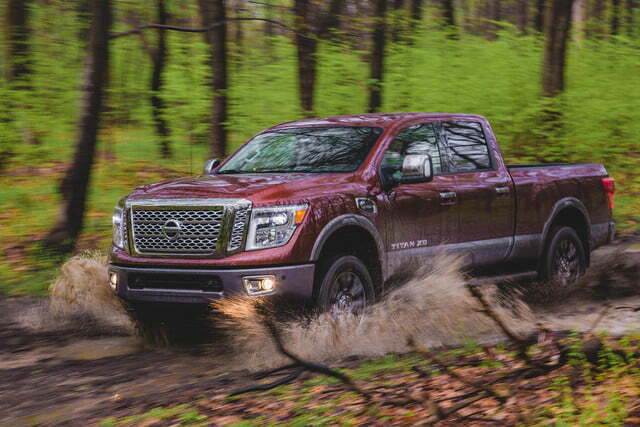 After all, truck buyers have diverse needs. You might need one for towing or hauling. 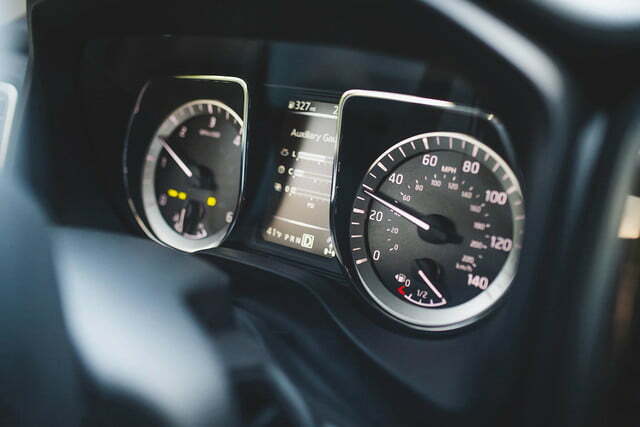 You might need to keep going when smooth stretches of asphalt end. 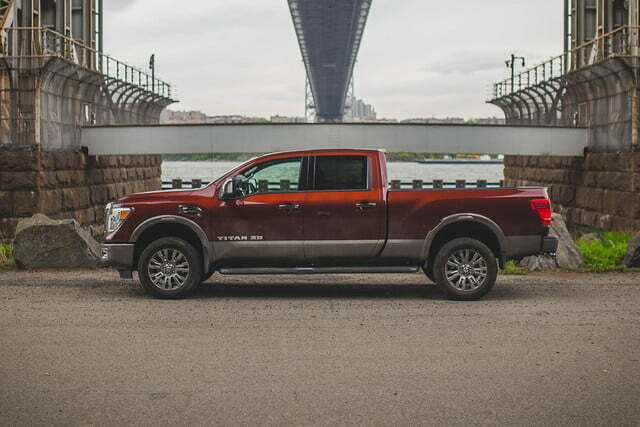 You might just love the commanding view of the road and feeling of invincibility only pickups provide — the feeling of being king of the road. Or maybe, like me, you just had an ancient, broken Mercedes to move over 300 miles and an itch to do some off-roading. 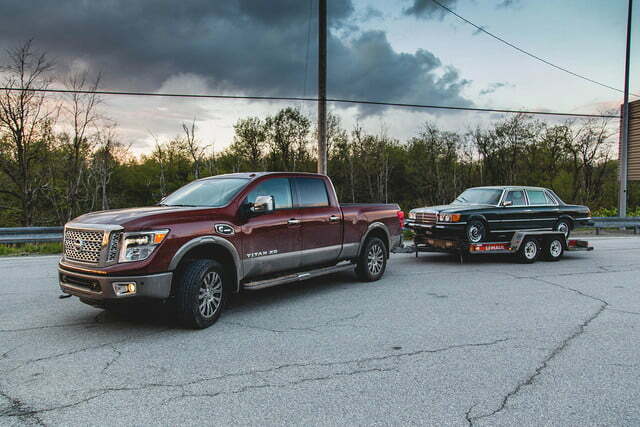 To handle my predicament, I saddled up in a 2016 Titan to see if it was capable of towing 4,300 pounds worth of vintage Mercedes along with 2,200 pounds of U-Haul trailer, plus many miles of rocky, muddy off-road trails. This truck was about to get dirty. 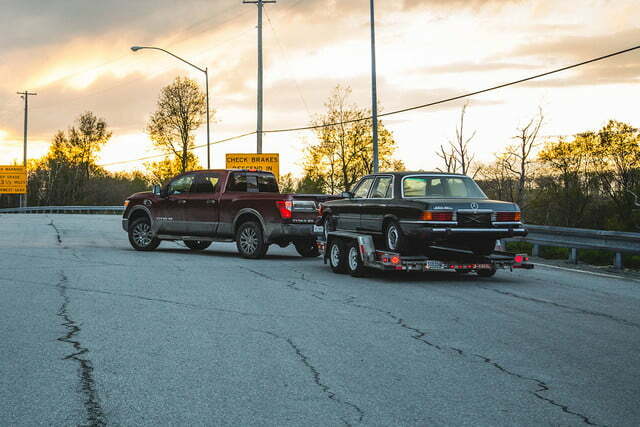 Pickups have always been big, not because they’re bred from the same cultural obsession with excess that brought us the Big Gulp, but because they have to do big jobs. “Big” also physically symbolizes toughness and power, reinforcing the stereotype that size does matter, and truckers tend to like that. 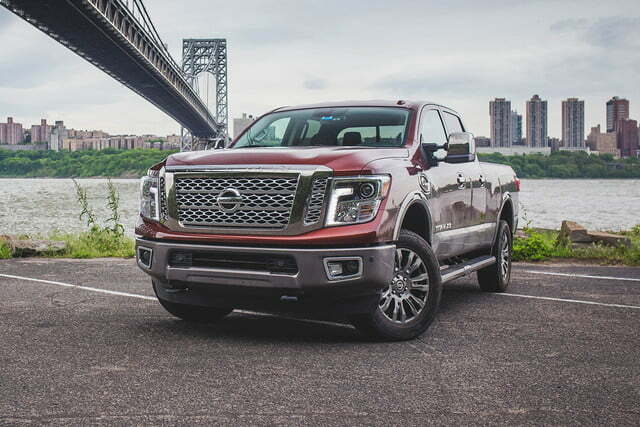 At 242.7 inches long, 80.7 inches wide, and 78.8 inches tall, the Titan sits longer than a Chevy Silverado or GMC Sierra HD by 3.5 inches with almost an inch advantage in height. So it ticks the size requirements with no issue. The Titan also looks best when muddied up, not to hide unsightly design cues, but because all pickups look great when dirty. 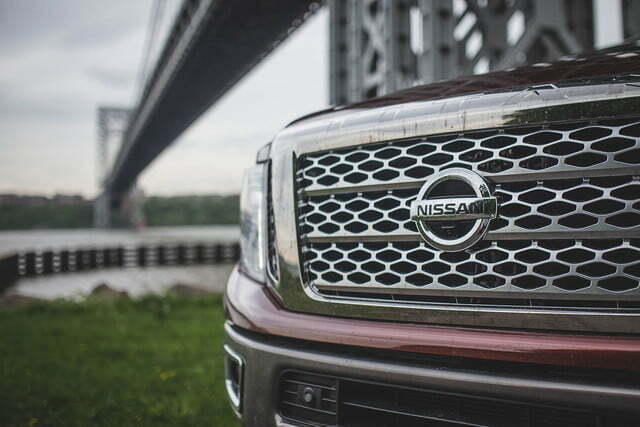 Hosing it off reveals an obligatory chrome front grille to help the Titan fit in with the rest. 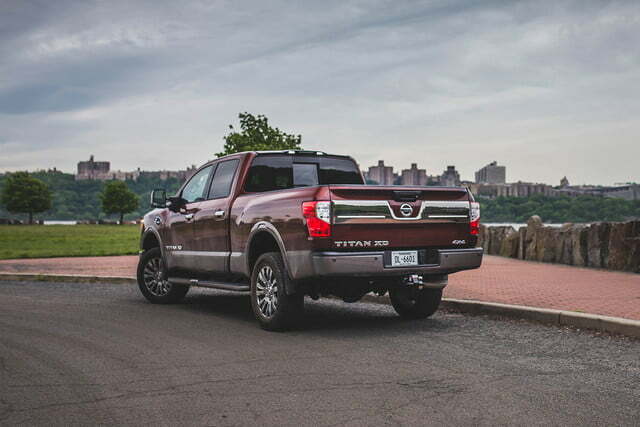 But unlike the rest of the seemingly over-designed pickups available today, the Titan’s panels are clean, and the appearance refined. The two-tone color combination of the underbody cladding also reduces the shock factor of its massive proportions. On the road, it garnered enough attention from spectators to make me feel like one of the cool kids in high school. After a week of walking to and from it, I’m convinced the Titan XD is one of the better looking trucks you can drive off a lot today. Sir, may I interest you in the Platinum Reserve? Despite being named like an expensive whiskey, the Titan XD Platinum Reserve doesn’t come festooned with precious metals, and it isn’t aged in oak for decades. It means the options list is fully checked, including front leather buckets that keep your backside cool or hot to your preference, satellite navigation and radio, Bluetooth connectivity, a pulsating Rockford Fosgate 12-speaker stereo, Nissan’s smartphone connectivity suite, and pretty much everything you’d expect to find in an Infiniti, not a pickup. 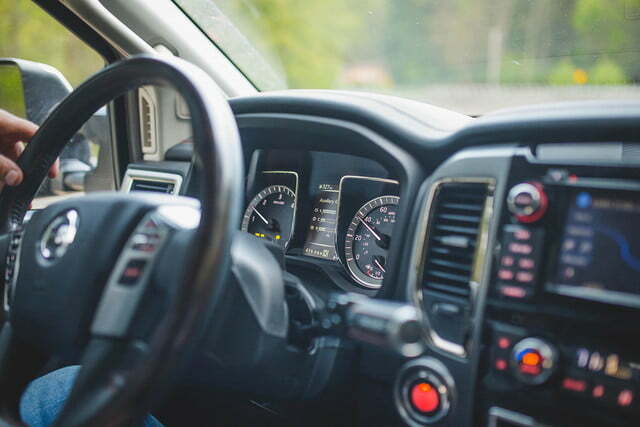 All these refinements lead to an identity paradox that’s increasingly common in luxury trucks: It’s built to roll in the dirt, but almost dressed too nice to play that way. It’s “a Texas thing,” I was told by many. The Ford F150 King Ranch, Toyota Tundra 1794 Edition, Chevrolet’s Silverado High Country, and GMC Sierra Denali suffer the same paradox. 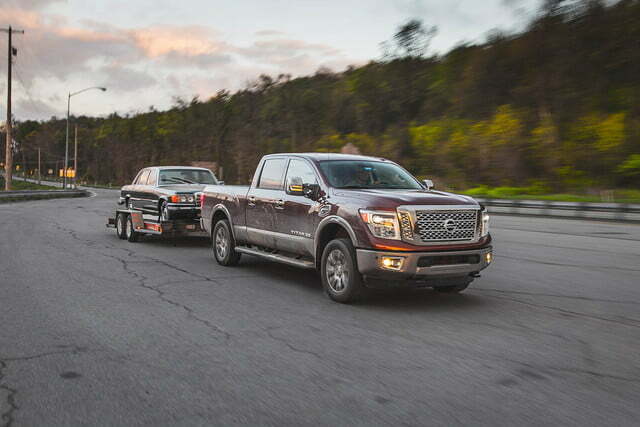 A conflicting image it may be, but these luxury pickups arguably make living with one of these workhorses less of a compromise. The Titan proudly sports a Cummins diesel, but it isn’t an inline-six transplanted from a Dodge Ram. Instead, it’s an all-new V8 with 310 horsepower and enough torque to slow the planet’s rotation: 555 pound-feet. 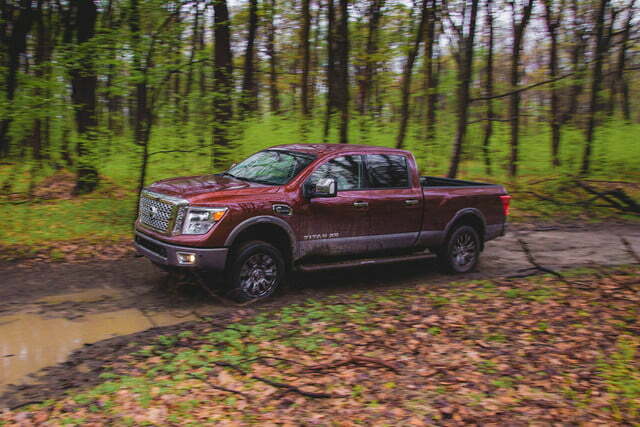 That bests any engine available in competing light-duty pickups. Nissan offers a gas 5.6-liter V8 with similar amounts of grunt and towing capacity, but it gulps fuel instead of drinking it. And for any skeptics wondering: No, it doesn’t suffer the same emissions woes as Volkswagen’s “cheater” diesels thanks to a urea-injection catalytic converter system. 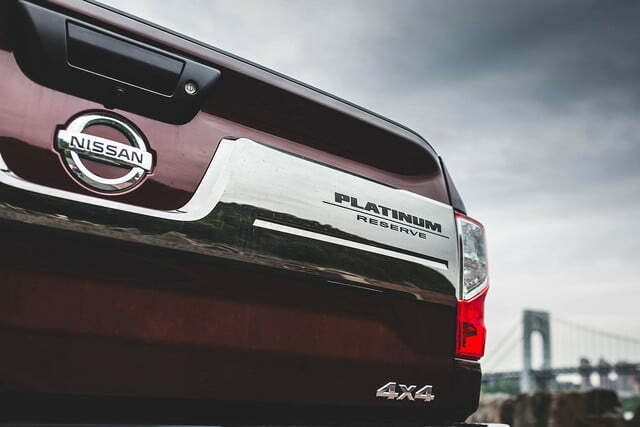 The Titan’s panels are clean, and the appearance refined. 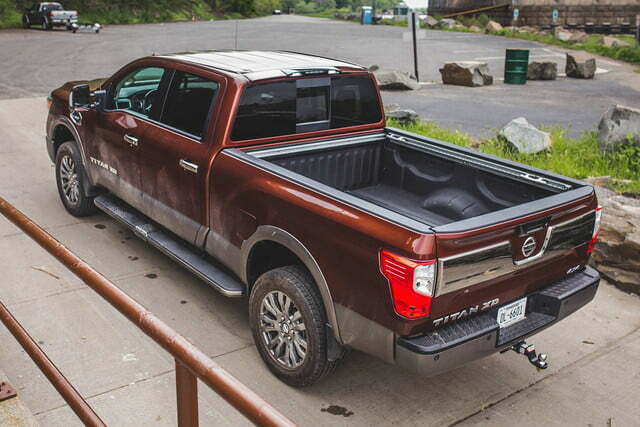 Without anything in tow, the Titan XD averaged 16 mpg across more than 300 miles through Pennsyltucky. 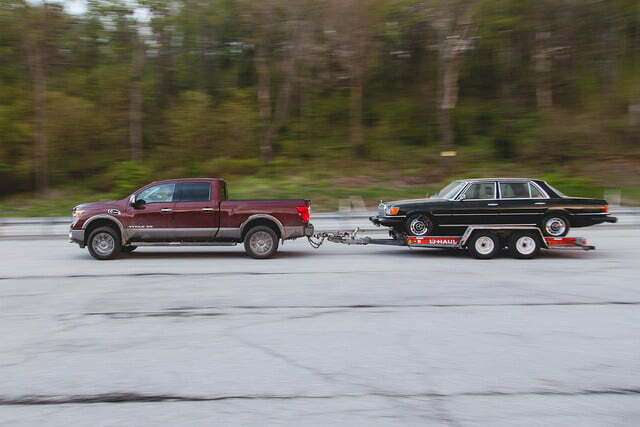 With the Mercedes 450SEL strapped to a U-Haul trailer and hitched to the Titan, adding nearly as much weight as another Nissan Titan behind the XD, the economy rating only dropped by less than two mpg to an average of 14.5 mpg, according to the on-board trip computer. 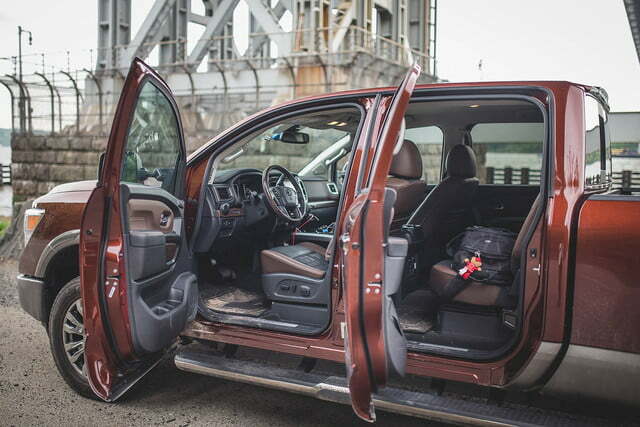 It’s no Prius, but then again, the Titan weighs nearly three times as much. 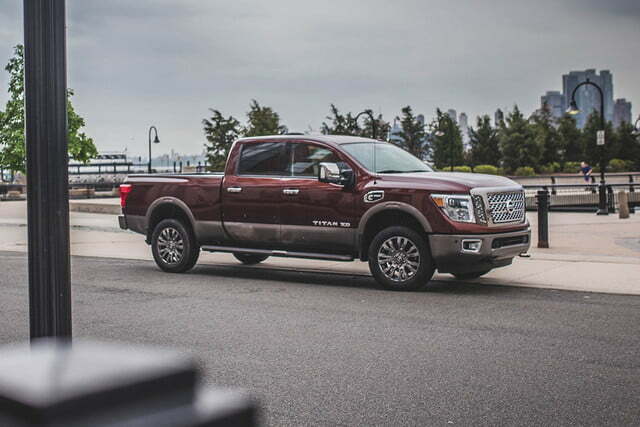 The Titan may tower above traffic like the Empire State Building on wheels, but it behaves more like a refined luxury SUV, ridding any trace of its truck-ness. 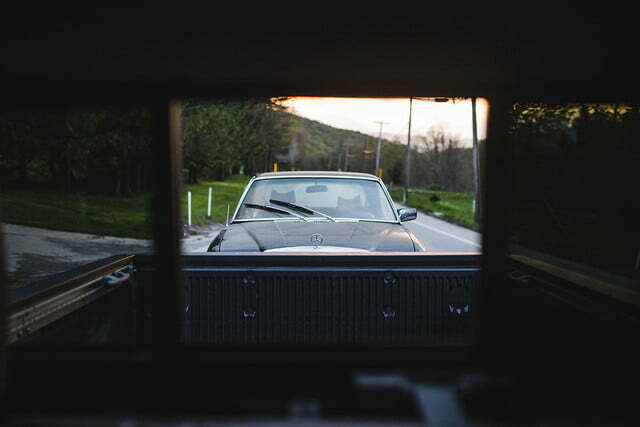 That is, until you look in any of the rear-view mirrors. It also trudged effortlessly over the rivers, through the woods, and literally to my friend’s grandmother’s house while rescuing a broke broken and stranded Ford F-150 Raptor on a steep and rocky adventure through the Appalachian Mountains. 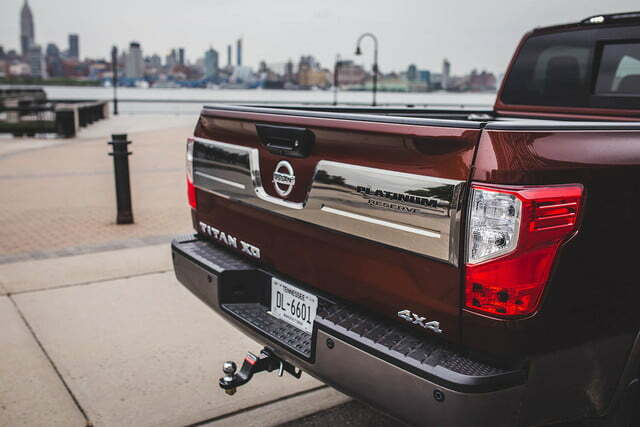 The biggest takeaway: The Titan offers heavy-duty capabilities in a palatable package you can live with daily. Its soothes bumps that make heavy-duty competitors jitter. These stiff and over-sprung and stiff American trucks may be sturdier and more rugged, but you’ll pay for it on pavement. The new Cummins diesel also gives the Titan a clear advantage in both the fuel economy and grunt department, when most competitors offer only gas engines. This means you’re pretty much SOL if you’re looking for a lighter-duty diesel from Ford or GM. 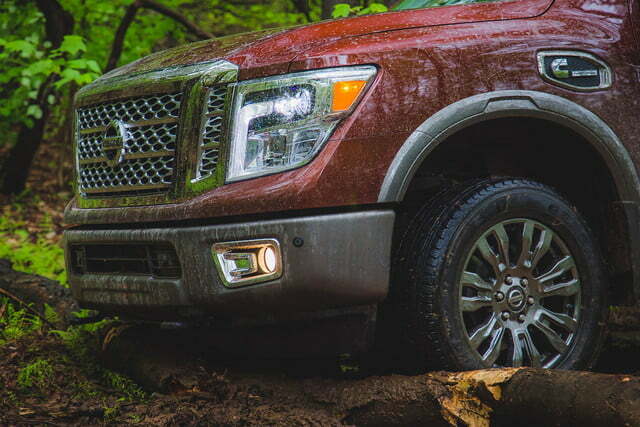 The Nissan Titan steps in to fill that void. 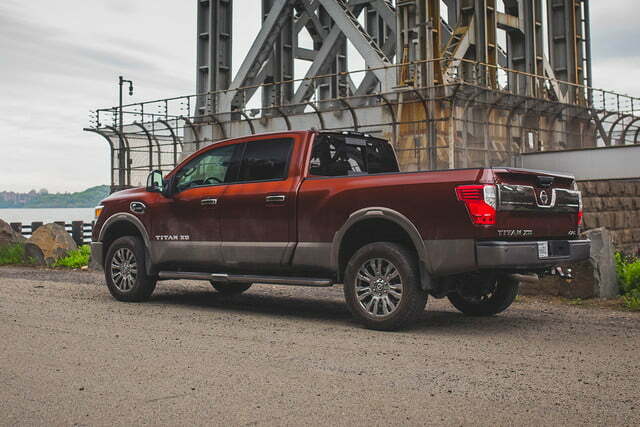 The one exception would be the Dodge Ram EcoDiesel, but its max tow capacity of 9,210 lbs is limiting to the Titan’s 12,700 lbs. 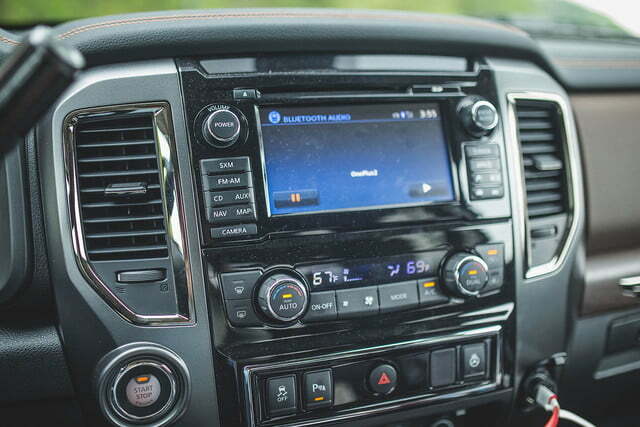 Toyota cannot even be considered, with no diesel option for any of the Tundras. Our Titan XD Platinum Reserve ticked every box on the options list, which might induce some sticker shock at a shade under $64,000. Yes, you could technically get a less-equipped, heavier duty truck from the Big Three for less. 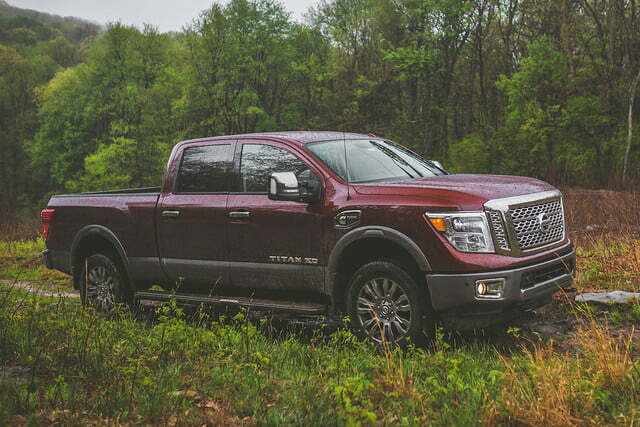 But with the Titan XD, you’re getting the closest thing to an Infiniti truck, with all the capability of a workhorse pickup.